APV-2 Pneumatic Driven Ventilator. Includes Air Duct Connector rings on both intake and exhaust ports. 25ft. attached Static Bonding Cable. Lightweight. Very durable and reliable. Requires 50 cfm at 80 psi ( 85m³/hr at 5,6 kg/cm²) for desired performance. Variable speed capability. RA-8X 8” x 15’ ft. (203mm x 4,6m) Static Conductive Air Duct. Includes attached Air Duct Connector Rings and built in self stowage device. Designed to connect together for extension purposes. Features a non-collapsible diameter design throughout the length of each duct. AP-208 Fuel Tank Underwing Access Duct Adapter. Connects to 8” diameter ducting. Designed to increase air flow circulation within fuel tanks. This flexible adapter can be inserted through most underwing fuel tank access openings. Provides a method of securing air duct to fuel tank access point and prevents the duct from falling out of the tank. AF-178E Electric Driven, Explosion Proof Ventilator. Designed for Hazardous locations. Includes Air Duct Connector Rings on both intake and exhaust ports. 50’ft. of attached heavy duty electrical cord. Completely wired ready to use. Designed to operate with 115 volt, single phase 60 Hz, AC electrical current. 20 Amp Circuitry. GC-500 20’ ft. (6m) Static Bonding Cable Assembly designed to be used with the electric driven Ventilator. C-808 8” to 4” (203mm x 101mm) Air Duct Reducer Adapter. Connects the 8” (203mm) diameter Duct to multiple 4” (101mm) diameter air duct lengths. One connected 4” (101mm) Air Duct Cap provides the option to use one or both 4” (101mm) Duct Ports without losing air flow efficiency. RA-4X 4” x 15’ft. (101mm x 4,6 m) Static Conductive Air Duct. Includes attached Air Duct Connector Rings. Designed to connect together for extension purposes. HIB-100 Inlet Compressed Air Hose Assembly. This 100’ft. (30m) Compressed Air Hose Assembly features attached quick-disconnect fittings. 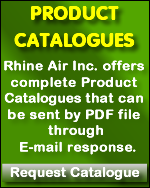 Sized to supply proper compressed air flow and pressure to operate the Rhine Air pneumatic driven ventilator or Breathing Pump.